Sadly, I wont be making Geek Girl Con, BUT YOU SHOULD! Something I was looking forward to, finally came down to it, and It looks Like I wont be able to make it. Bad timing this year with a lot of random things. I'm definitely marking it on my calendar for next year. I'm hoping some of you are able to make and take pictures!!! Check out the strateg guide, it looks promising as a con. So after posting this, I received this e-mail. 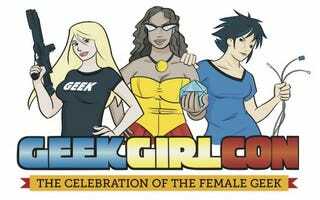 Good morning, If you are receiving this email, you are officially registered as press for GeekGirlCon '13. I'm excited to work with you during the convention. I'm sorry you won't be able to make it this year. We'd love to have you next year though! PR manager saw my post and responded to me! It really warms my heart and makes my day! I GOING TO MAKE IT NEXT YEAR.